My first Hello Kitty Cafe experience at its newly opened Uptown Bonifacio branch wasn't exactly love at first bite. In fact, I was disappointed with it. But it was hard to decline an invite from the well-loved Sanrio character. As a believer of second chances, I found myself back at this very pink place two weeks after my first visit. 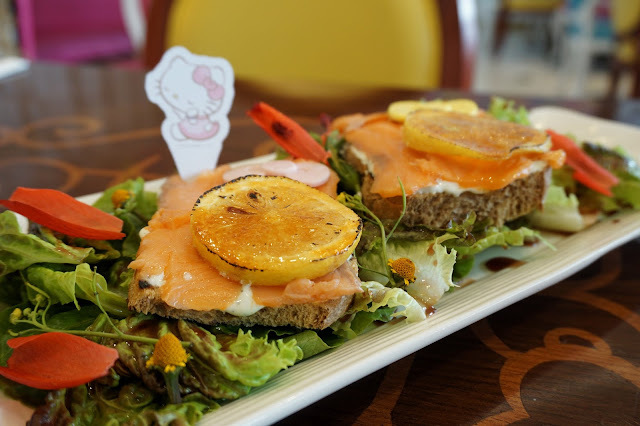 Hello again, Hello Kitty Cafe! 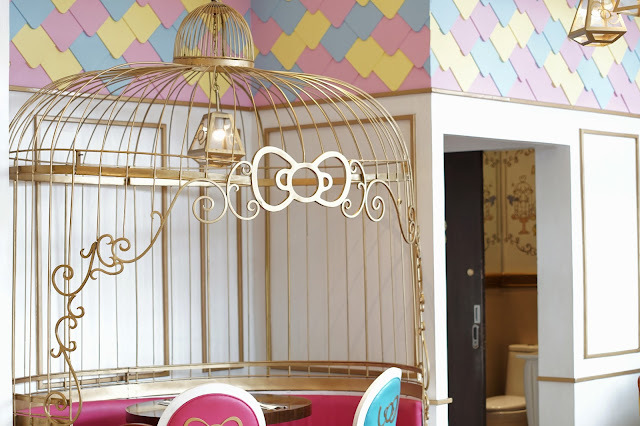 This time around, I was warmly welcomed by one of the staff who ushered me to my reserved seat, the most requested couches with what seems to be enclosed in a huge golden bird cage (with the signature Hello Kitty bow). 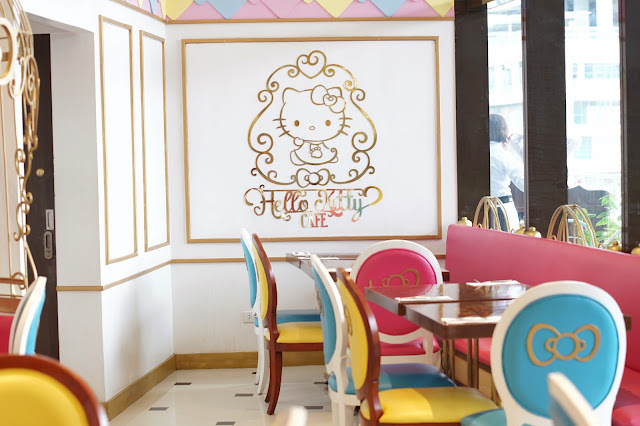 Apparently, Hello Kitty Cafe do accept reservations, but only on weekdays. Since I wasn't too happy with my picks from my first visit, I asked the staff to help me choose the bestsellers. 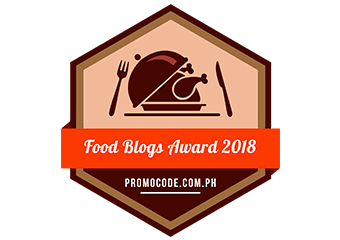 And I ended up with Roasted Pumpkin Soup (PHP185), Quiche Lorraine (PHP295), Salmon and Dill Tartine (PHP395), Shrimp Scampi (PHP440), Pork with Herbes De Provence (PHP525), Truffle Fries (PHP165), Matcha Green Tea Frappe (PHP295), Mango Charlotte (PHP520), and Chocolate Truffles (PHP295). First served was my glass of Matcha Green Tea Frappe. It was more than just a photogenic drink. It was pretty good too! 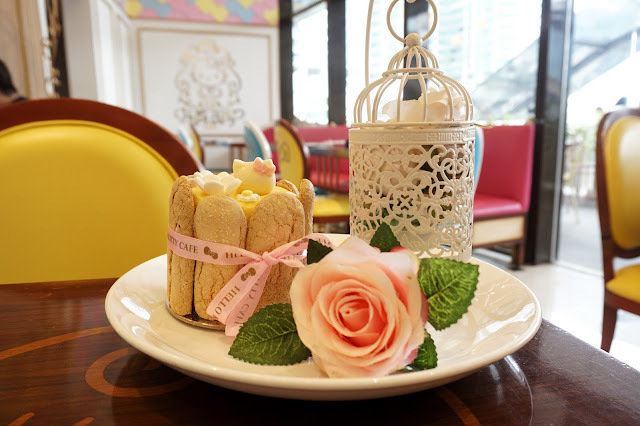 The pronounced taste of green tea with a sweet note makes it enjoyable even for non-matcha lovers. I find the price a bit too much for its serving size though. 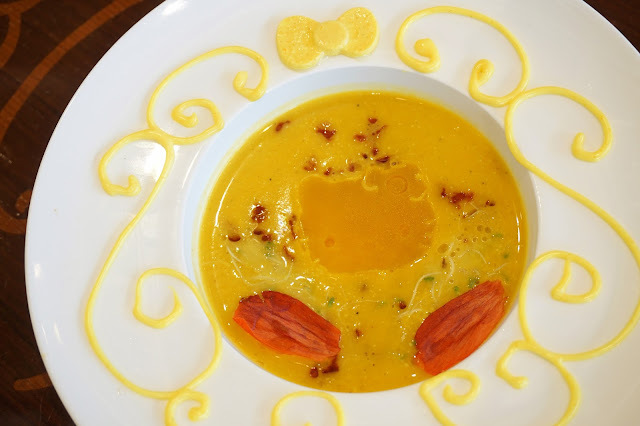 The bowl of Roasted Pumpkin Soup was great too. It was thick and slightly sweet, just the way I like it. 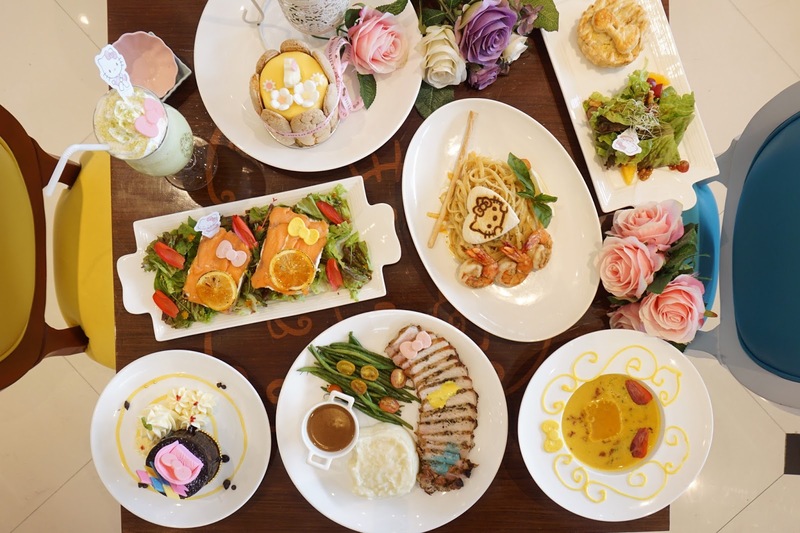 The Hello Kitty design on top is actually made of pumpkin too! I liked this even more with a dash of pepper. 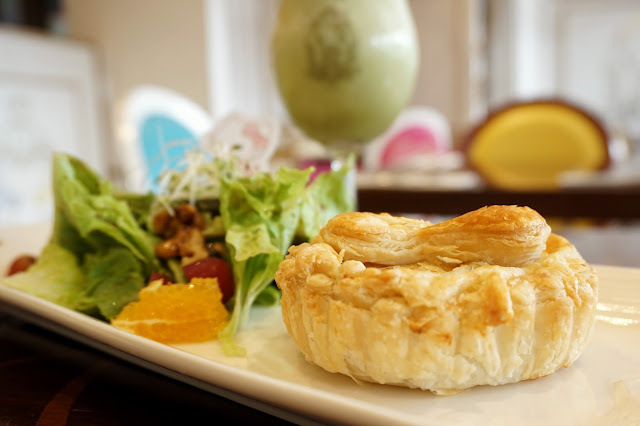 Quiche Lorraine or your savory custard stuffed with bacon and cheese was good too but forgettable. It didn't have any unique or strong flavor that made an impression. I remember that it was filling though and it would be a nice snack to munch on with tea or coffee. I wasn't too fond of the Salmon and Dill Tartine. Though I am a big fan of salmon, I found the sweetness of the sauce a bit weird with salmon. 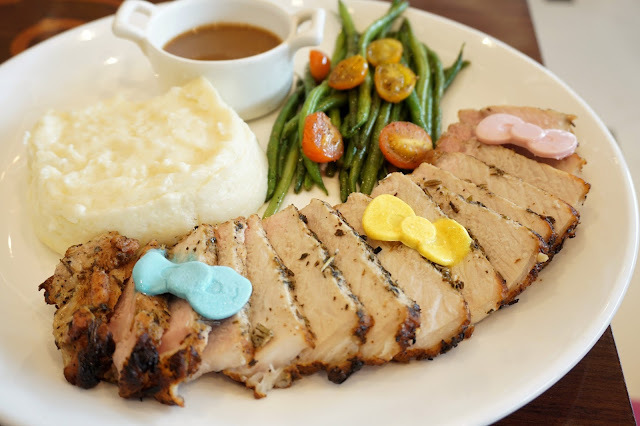 I guess this dish is meant for those who like sweet savory dishes. 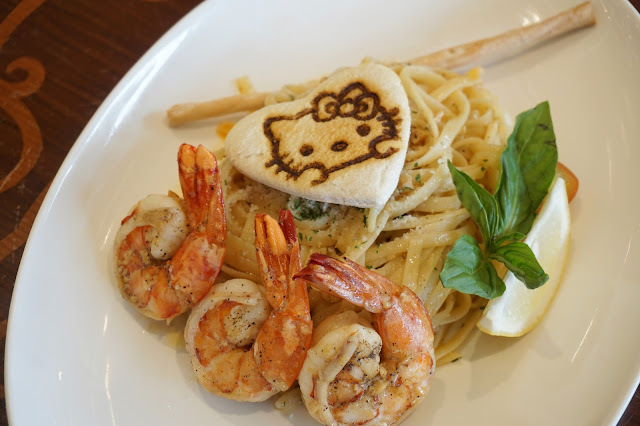 One of my favorites during this visit was the Shrimp Scampi. It was absolutely divine! The pasta was al dente and the oil-based sauce highlighted the light taste of the fresh shrimps. I drizzled it with a bit of lemon juice for that extra sourness perfect with seafood! I would definitely get this again! Another favorite of mine was the Pork with Herbes De Provence. 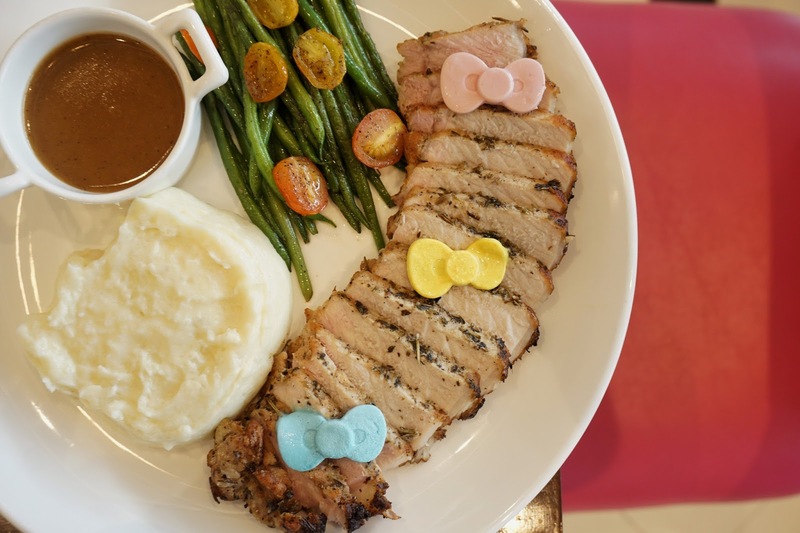 Though one of the pricier dishes, its tender and flavorful pork slices will make you feel that you get your money's worth. The succulent meat can be enjoyed as is or with gravy. I also liked the creamy mashed potato it went with. I ordered Truffle Fries just because I was curious about it. I then realized that it didn't really go with any of the other dishes I had. Taste-wise, it didn't have the truffle taste I was looking for. 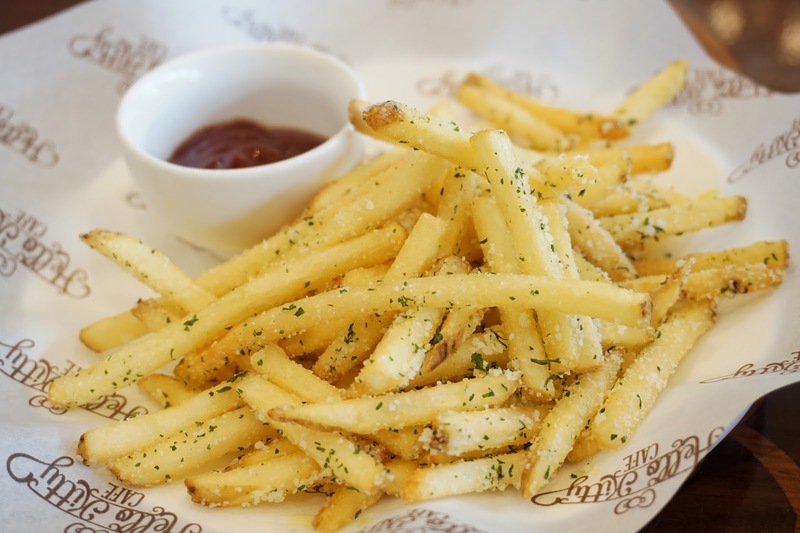 But it was perfectly fried though, perfect as a light snack to go with some of Hello Kitty Cafe's sodas. I was quite excited for desserts as I missed it in my first visit. I tried Chocolate Truffles first and was overwhelmed by the richness of it. I only had one mouthful and had to wave the white flag. It was too cloying for me. 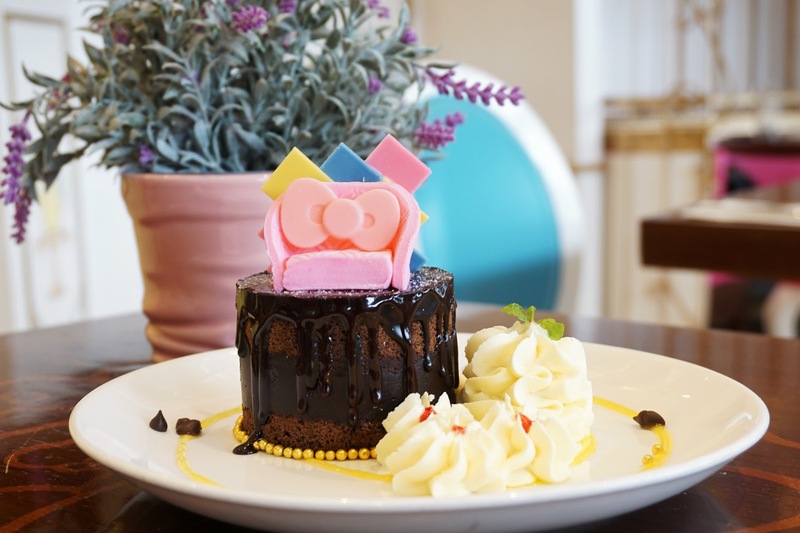 Foodies with serious sweet tooth will love this though. I preferred Mango Charlotte more as it had a lighter taste and reminded me of my favorite mango cake from a local bakeshop. However, I wouldn't order this again even if I liked it as I simply could not justify its price with its serving size. Cute but not big enough to warrant PHP520. Then again, I might splurge and get one when there's something worth celebrating. Overall, I was glad that I gave Hello Kitty Cafe a second visit. I discovered some favorites I would love to have again soon. I will surely get more Shrimp Scampi and Pork with Herbes de Provence. I'll also try the other soups next time. 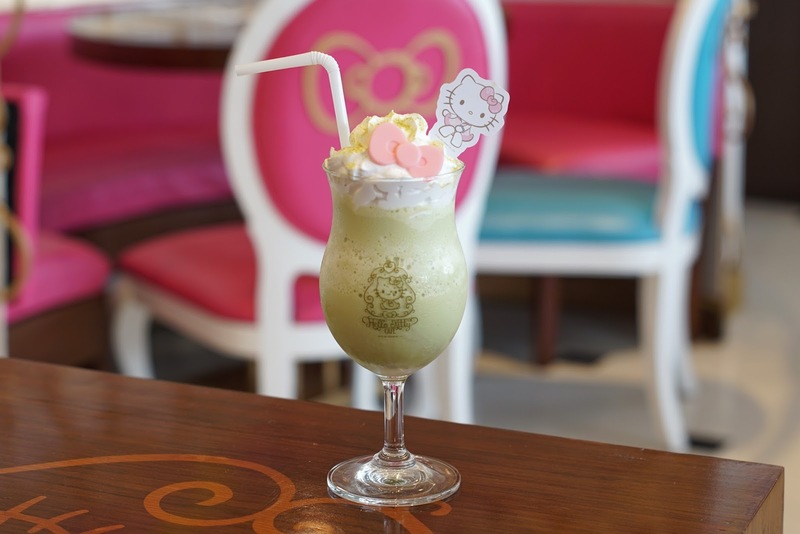 Hello Kitty Cafe is located at 3rd Floor, Uptown Bonifacio, 9th Avenue, Fort Bonifacio, Taguig City.